Summer 2015 will be the dawn of a new era for Toyota. The Toyota Mirai, pictured above, will go on sale in the UK and will cement its place in history by becoming the first production fuel cell Toyota. Ahead of its eagerly anticipated launch, we take a look back at the fuel cell concepts that have helped us to develop the ground-breaking car, in chronological order. Unveiled in 1996, the FCEV-1 was the first of a series of first-generation RAV4-based Toyota fuel cell vehicles and was the first-ever Toyota fuel cell concept car. Initially fitted with a hydrogen-absorbing alloy storage unit, the concept was developed further in 1997 when the FCEV-2 arrived, and was equipped with a reformer that extracted hydrogen from methanol. Based on the JDM and American market Toyota Highlander, the FCHV-3 and FCHV-4 had fuel cell stacks that put out 90kW — more than four times that of the FCEV-1 — to give a 94mph top speed and a cruising range of 155 miles. The FCHV-4 — mechanically very similar to the FCHV-3 — was the first Toyota fuel cell hybrid vehicle to be licensed for testing on Japan’s public roads. The tests began in June 2001, continuing for three years, and were designed to measure the car’s performance on highways, steep hills, and other demanding environments. Later in 2001, the FCHV-5 was revealed. The FHCV-5 was still based on the Highlander, but the model’s Clean Hydrocarbon Fuel (CHF) reformer — which generates electricity from hydrogen derived from CHF — featured a newly developed catalyst, heat exchanger, and other components to boost acceleration and economy. The FINE-S made its global debut at the North American International Auto Show in 2003. The concept car used a hydrogen fuel cell hybrid electric power system, housed beneath the vehicle’s floor, creating a low centre of gravity. Power was delivered independently to all four wheels. 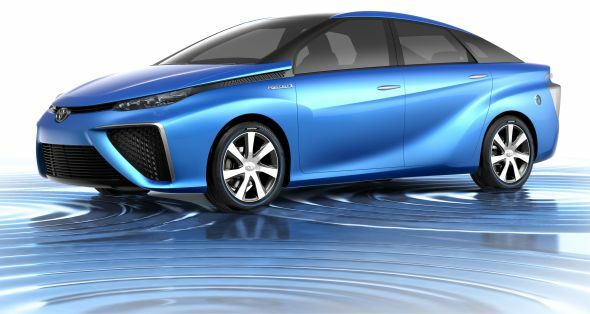 The Fine-N (Fuel cell INnovative Emotion-Next generation) was unveiled at the 2003 Tokyo Motor Show. Its hydrogen fuel stack stands just 150mm tall and is housed under the car’s floor, along with an energy dense lithium ion battery. The fuel cell in the Fine-N is smaller than in the FINE-S that went before it, and this was made possible by storing the compressed hydrogen under greater pressure — 70 megapascal (mpi) or 10,150 psi, or about 700 atmospheres. The system’s range is 312.5 miles. Instead of a conventional drivetrain, the Fine-N uses by-wire steering, braking and throttle controls. With no mechanical constraints, the steering wheel and pedals can be positioned to suit the preferences of any driver. The wraps were taken off of the Fine-T concept at the 2005 Tokyo Motor Show. The innovative model boasts the cabin space of the Toyota Avensis within a package that is roughly the same size as the Toyota Yaris. An independent four-wheel large-angle steering system allows for an extremely tight turning circle that is impossible to achieve with any conventional car. The below photo shows the system in action. Effectively an updated version of the FCHV-5, the FCHV-adv has a range proximity of 515 miles. This was made possible thanks to the fitment of a high-pressure hydrogen tank. The FCV-R debuted at the 42nd Tokyo Motor Show in 2011. The model is 35mm longer than the current-generation Toyota Avensis at 4,745mm in length, and once again the fuel cell stack is smaller than in previous FCVs. The cell sits under the seats, along with twin hydrogen tanks, to provide a low stance. The combined volume of the fuel tanks gives the FCV-R a driving range of around 435 miles. The location of the tanks and stack beneath the vehicle floor maximises cabin and luggage space. Visually, the FCV concept is closely related to the FCV-R; it was unveiled at the 43rd Tokyo Motor Show in 2013. Under the skin, the model is also similar, and features a proprietary compact and lightweight fuel cell stack and a pair of high-pressure hydrogen tanks. The Toyota FC stack has a 3kW/l power output density — more than twice that of the system previously used in the FCHV-adv concept — and a maximum power output of at least 100kW. It is also equipped with a high-efficiency boost converter.